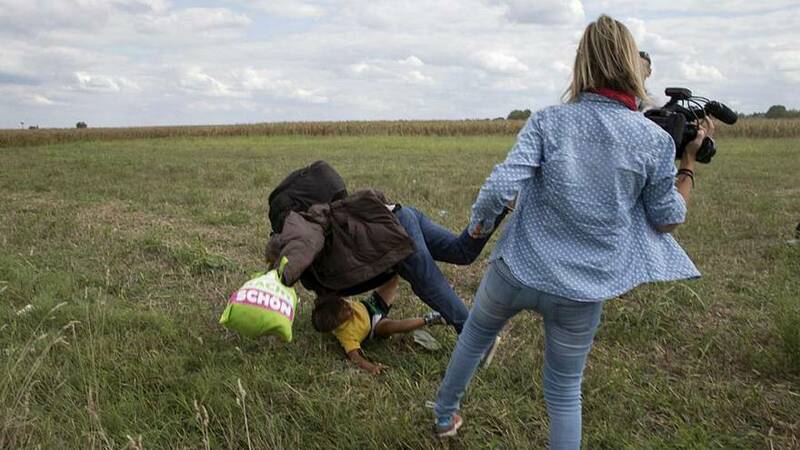 The video went viral — a Hungarian camerawoman was filmed tripping and kicking migrants as they fled police near the Hungary-Serbia border in September 2015. The incident became a symbol of the negative, sometimes violent, reception encountered by many migrants. The Hungarian Supreme Court, the country's highest court, has now acquitted Petra Laszlo. The decision, announced Tuesday, saw the rulings of two lower courts that handed the camerawoman three years' probation last year for disorderly conduct revised. She should have been charged with a misdemeanour and not a criminal offence, the Kuria, Hungary's supreme court said. It added that the case must now be concluded since the statute of limitations had expired. Petra Laszlo was fired from her job at N1TV, a television station with nationalist sympathies, after the video footage spread online. In January 2017, a first instance court in the town of Szeged found Laszlo guilty of "breaching the peace" after prosecutors had previously said there were no grounds to charge her with a racially motivated hate crime. The camerawoman claimed she was acting in self-defence in her testimony, as seeing hundreds of people running towards her left her in a frightened state, which led her to react instinctively to avoid being pushed over. Her lawyer, Ferenc Sipos, said she could not appear in court in person after receiving death threats. “It is not a crime if somebody acts to defend herself...she was in danger, and she tried to avert this danger with her actions,” he told the Associated Press. In an interview with the Izvestia newspaper, Laszlo said her life was “ruined” by the footage and threatened to sue Facebook over threats and defamatory comments. The second instance court approved the sentence in October 2017 until the Supreme Court on Tuesday ruled that her behaviour did not disturb the calm of the community and was simply disorderly conduct. The Kuria added that the influx of hundreds of migrants going up against a police operation caused chaos. Hundreds of thousands of migrants from the Middle East and Africa passed through both the Balkans and Hungary in 2015, as they headed to western Europe, which led to Prime Minister Viktor Orban’s government strengthening Hungary’s southern border. Anti-migrant sentiment in Hungary has swelled as the far right has become increasingly emboldened. Earlier this month Orban blasted Brussels for "deliberately" failing to defend Europe from migration.